Hi Dare 2B Artzy fans! I’m back today to share my Christmas tag that I created using the Dare 2B Artzy Poinsettia Tangle stamp. 2. Disappointment – its been 70 degrees here in Colorado which is very unseasonable and is not inspiring me to get into a holiday state of mind (much less inspiring me to do any holiday shopping). My tag today features the gorgeous Poinsettia Tangle stamp which is a new release this year with Dare 2B Artzy. 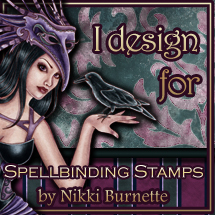 This stamp set features 4 image stamps and 4 sentiment stamp sets. To start, I stamped and heat embossed the poinsettia and the holly leaves with some champagne embossing powder. I really love this stamp and I wanted to create something that didn’t have the standard colors for a poinsettia. I dug out my Zig Clean Color water color brush pens and did a little water coloring. I started with a couple different colors of red and then blended it out to a couple shades of purple with the lightest being a lavender purple at the tips. I love how the red mixed in some areas with the purple and made a sort of deep burgundy color. I heat set the water coloring to see if there were areas that needed more color or blending after it was dry and then went back in and added some more red and purple. I love the Zig pens for this reason, its super easy to layer colors to make them brighter or even go back in and blend out the colors more by adding a bit more water. The paper I used was Canson 140lb water color paper. Once I was happy with the result, I fussy cut the poinsettia and the holly leaves which was a bit tricky with the water color paper due to the thickness, but they came out ok. After everything was cut out, I added some red gems to the center of the poinsettia to give it some extra pop. With the colors of the poinsettia being very vibrant, I decided to put them against a black background. I used a tag that I’d had. This is actually a chalkboard tag but it worked well for this project. I misted my tag with a layer of shimmer spray in a blue to give it a subtle shimmer. I added a strip of red and gold Washi tape off to one side. I layered on the holly leaves and the poinsettia using some dimensional foam. The words Merry Christmas were die cut from some shimmery purple cardstock and glued in place on my tag. The final touch was tying on a piece of gold and black ribbon. I thought I could use this for a gift tag on a special gift this year for Christmas and I could either use some chalk to put the To/From on the back or I might be able to find a nice metallic marker that I could use as well. I hope you’ll check out the Dare 2B Artzy store today. There are so many great seasonal stamps and dies that would be perfect for all your holiday card making & crafting needs. Also, if you have any friends and family that love to craft and make cards, think of what a wonderful gift a fun stamp set from Dare 2B Artzy would be for that perfect crafty friend! You could even pair it with some papers and ink for an awesome gift pack. Also, we still have our Thanks Challenge going on through the end of November. We’d love to see what inspiration you have for this challenge and let us know what you’re thankful for in your life. I won’t have another project to share until after the Thanksgiving Holiday so I want to wish everyone a wonderful Thanksgiving. Hope you enjoy the holiday with your family and friends. I will be spending it with my husband, my mom and step-dad. I’m looking forward to the long weekend and some quiet time to reflect on my many blessings and the people that I’m thankful to have in my life. Enjoy your day! Your tag is so absolutely GORGEOUS! !